Located in the heart of OIB, adjacent to the pier, OCEANFRONT 2 bedroom, 2 bath condo with sleeper sofa and a bunk nook for additional sleeping. 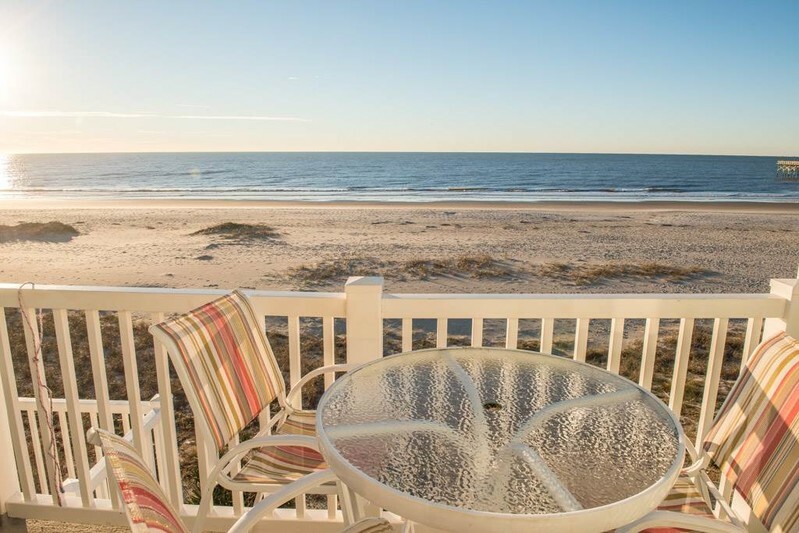 Watch the dolphins, boats and sunsets from a private oceanfront pocket balcony. Access to an oceanfront pool, hot tub, beach walkway, community charcoal grills, and outside shower. In addition to two bathrooms, the Master bedroom has a Jacuzzi tub. Walk to shops, restaurants, mini-golf. Live outdoor music every Friday in the summer by the Coastal Museum. Other amenities include fully equipped kitchen, microwave, dishwasher, washer/dryer, 2 flat screen TVs with cable, DVD player, and wireless internet access. Non-smoking, no pets. Blue Ribbon property: All beds will be made upon arrival and towel sets provided for your stay! Sleeps 8. Bedding: Queen, Queen, Queen Sleeper Sofa, Bunk Bed in nook. Recent updates include new flooring, updates in bathrooms, kitchen, some new appliances in kitchen and new washer/dryer.